The best bit about the coffee machine (or worst, if you don't like to hoard. Not me, then) is the empty coffee bean tins. We aren't saving any more, because we found a cheaper way of buying beans (thanks to the bean counter here, er, counting beans); but we do have quite a collection. Every so often Little E likes to stack them up in a pyramid and then cover his ears and wait for the crash. I keep meaning to do something useful with them. If I could get blackboard paint to stick, I think they'd look good, or washi tape, maybe? That would be a lot of washi tape, though. I'll keep thinking. Get It Scrapped recently asked me for a layout about drinking coffee and so I set to work to make one about the empty cans. But, as I pushed the paper around, trying to echo on the page what I could see in the photo, it turned into a different story altogether. I started to think about the way I drink coffee. And that's where my second question of the day comes in. Out? or in? Because I've realised that my chief pleasure in drinking a coffee at home is in enjoying it while doing something else on my own. 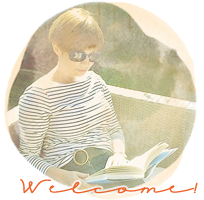 I like to read or blog hop or maybe write a list. Quietly, with my head down, without talking to anyone. I like to have guests round my kitchen table for a meal, that's when the chat gets going, but for a coffee? with friends? A coffee shop is best. Why is that? What is it about sitting at a table, surrounded by people we don't know that makes me - and my coffee friends - want to talk more? We spill more secrets when stranger might hear. Like telling your life story to someone you have never met as you sit beside them on a bus. A bit like that. Or is it just me? Probably more cups of coffee than tea in a day, although it was the opposite when I could tolerate ordinary tea. Now it has to be rooibos for me, which is fine because I like it. I have a "plunger" for my ground coffee but more often than not I grab the instant! In answer to your second question: Out! Every time. Being a stay at home/work from home Mum, I grab the opportunity to escape my four walls to have coffee with a friend. 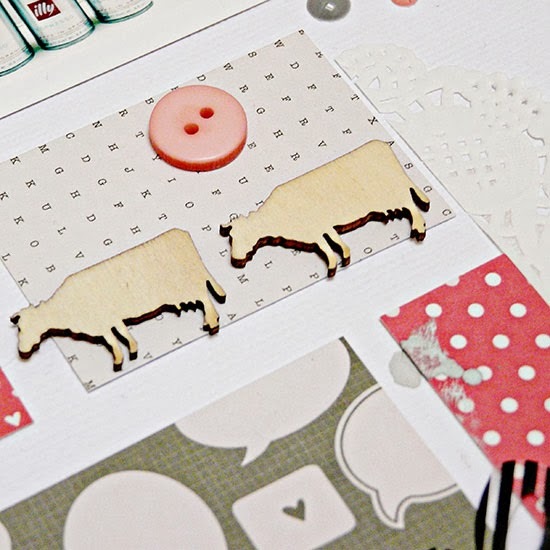 Loving those little wooden cows on your page. I'm a coffee person but do like an early morning cup of tea. This is just gorgeous, Sian - feels like a double expresso coming here today, with the headiness of the interesting thoughts and questions and stunning aroma of your wonderful page to look at! I love the smell of coffee, but partaking of one a day is sufficient for me. Tea? Now there's another story altogether. And I do love a cup of something just by myself too. PS Sorry about the mixed metaphor - too much expresso! These days I drink a lot more tea than I ever did and hardly any coffee. I like the whole social side of of coffee out and I find that when I am on my own, my cuppa is often forgotten because I am busy doing something else. I love, love, love those wooden cows! Forgot to say that I love the look of your layout and may scraplift. I'm definitely a coffee drinker in the morning: strong and black. But in the evening during the winter, I do enjoy a cup of tea. Like you, I enjoy both while reading or working on the computer. 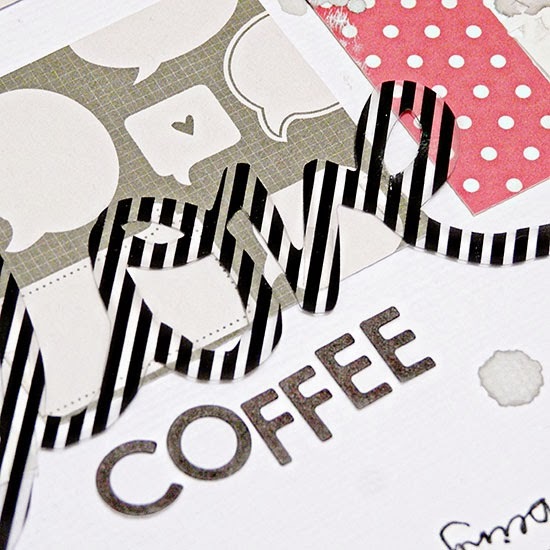 I LOVE the grid on your layout, and have pinned it for inspiration! I drink a lot of tea at home but thanks to the likes of Shimelle I started experimenting with coffee and now I'm very partial to a latte with a shot of caramel when we go out. Sometimes DH and I go out if he has a day off in the week so we actually sit and drink and read and not think about all the other things we should be doing if we were at home! I can't wait to use my teapot again - its been too long and you've reminded me! I used to drink real coffee without milk and sugar too then realised I was drinking soooo much and my tummy was suffering a bit so I gave up caffeine. Over time I have now become a big tea drinker.... can't get enough of the stuff.... but it is also without sugar and milk! Fab layout! I'm a tea drinker in the morning....usually chai....and coffee the rest of the time......but out with friends it's always coffee. 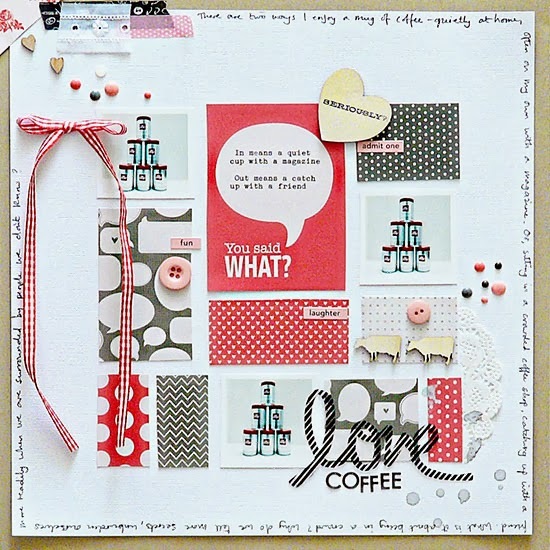 LOVE the layout and the colors you used, Sian! I also love all the stories that came up for you as you created your page about coffee. I love my coffee in the morning, made by Doug. But after those two cups I switch to tea for the rest of the day - iced tea. I had never had tea with milk in it until Carrie and I traveled to England last year. It was ok, but not something I would do on a regular basis. Neither. I'm not a hot drink girl but can be persuaded to have a peppermint tea on a very cold day, if I am desperate. However, I LOVE the smell of coffee. We have a coffee machine here as TE drinks it, actually, it is sounding really worn out and no doubt he'll be wanting to upgrade soon .... I don't even know how to turn it on! Another coffee drinker here! I used to have coffee out much more than I do now. I too love to drink my coffee on my own. LOve your layout, the little cows are lovely!! Im a total tea jenny Sian. I love it. At work from my red spotted mug and at home from my turquoise floral one. Another little cow fan here. I hardly ever drink coffee now, it used to be my favourite thing! I'm tea, single leaf Ceylon, Waitrose own label...so fussy! Another fabulous LO. I'm definitely the odd man out in this group! I don't drink coffee or tea, not because I'm avoiding some component of it, but because I never learned to like the taste of either and I can't tolerate the smell of coffee - seriously makes me nauseated. When I need a hot drink, my choice is hot apple cider. Thankfully, they make keurig cups for that! Wonderful layout, Sian. I'm not a coffee drinker, but never turn down an invitation to a local donut/coffee shop where I have a soda while everyone else oos and aahs for the smell and taste of their favorite blend. Banana walnut is the current fave. I could have tea, but I prefer to sip my tea at home - reading or bloghopping. Tea is contemplative for me, "coffee" is social. I am a tea girl. Never have and never will drink coffee! I can't stand the smell of it and when shops grind beans I think it is a disgusting smell. So when in I drink tea but when I am out I have hot chocolate with cream on top! Not a tea drinker here - which is good as Wookie drinks enough. Cut my coffee down to my one mocha a day usually - except on really bad days when I end up with a morning cup too. Used to love coffee shops and suspect I will again but at the moment I'm enjoying the quiet contemplation of sitting at home on my own or chatting on the sofa. I love coffee! But I switched over to decaf years ago due to my insomnia, which is so bad the caffeine from hot chocolate at night can keep me up. I use a French Press. Much less work to clean than my old coffee maker. My old coffeemaker hated decaf, it always overflowed and got grounds in the coffee for some reason. I don't like tea, unless it is cold, sweet and lemony, and even then I don't really like tea. wow Sian, a gorgeous grid design with pretty patterns. I have just completed a layout (for sjcrafts) and used a kind of grid design. I rarely drink hot tea but have been an iced tea drinker (sweet of course) all my life, I am a Southerner. I LOVE the smell of coffee and rink it but only one or two cups a day. I cannot drink it the way you do, I need a touch of splenda and flavored creamer makes it all the better. I like drinking coffee at home since most places make it more along the way you take it. We drink tea and coffee! Love your page! So many great little details. I love the overall design, too. Love your little wooden cows--even if you do not add milk to your coffee! I'm a tea drinker---diehard---and a snob at that. That's why I should have been born British! I love the mosaic of paper tiles on here, and the journaling all around the page edge! I used to love coffee but I guess I used up my life time's worth because now I can't drink it anymore so it's tea for me. I love going out and meeting friends over tea or just sitting in with a nice hot cup and my kindle.